Performing a word count in Microsoft Word is easy! Simply check the bottom left corner of the window and the word count is right there. If you are using an older version of Microsoft Word which does not have this, then you can find the word count by going to File >Info from the top menu bar. 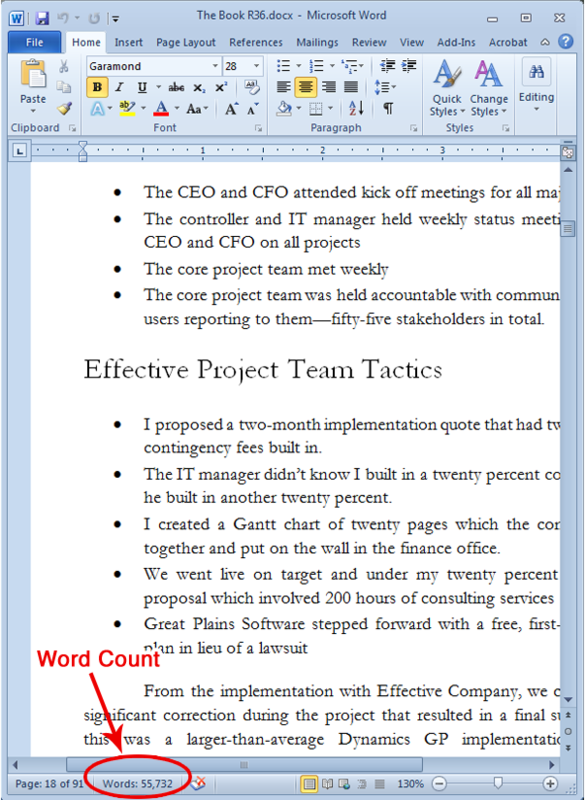 The resulting window will display all document properties including word count. Unfortunately none of the Adobe PDF viewers offer a word count tool. If your book manuscript is not available in a Word document and you are stuck with the PDF there are still solutions to finding your word count. Option A: Download a free trial of the software Word Count Tool by clicking here. Option B: With the PDF open use hotkeys CTRL + A (on a PC) or Command + A (on a MAC) to select all contents of the PDF, then use your mouse to right click and select “COPY”. Next, open a blank Microsoft Word document and use your mouse to right click and select “PASTE” – From here just follow the instructions provided above to check your word count in Microsoft Word.